Article: Pinocchio | Anime etc. As Disney’s classic Pinocchio is released on DVD and Blu-Ray, Andrew Osmond meets the man who was the puppet. Early on in Disney’s 1940 cartoon feature Pinocchio, a winged Blue Fairy in a sparkly dress touches her wand to a wooden boy marionette and declares, “Little puppet made of pine; Wake, the gift of life is thine!” Pinocchio wakes amid sunbursts, stretches and blinks his blue painted eyes, and we cut to the gnomelike spectator Jiminy Cricket, voiced by vaudeville star Cliff Edwards. Jiminy looks at us, lets out an impressed “Phew!” and chirps, “What they can’t do these days!” You can almost see Walt Disney’s ghost beam with pride at his cartoon magic. It’s entirely fitting that Pinocchio is being revived on DVD and Blu-Ray just as the Disney studio heads in two directions. On the one hand, Disney’s 3D CGI cartoon Bolt is playing in cinemas; on the other, the studio is finishing The Princess and the Frog, its first traditionally-animated cartoon for a while, to be released next Christmas. But Pinocchio linked handicrafts and hi-tech, taking them to levels of craftsmanship unsurpassed in the next seven decades. The film embraces the artistic and technical cross-currents, even contradictions, that pervaded animation then and now. We can’t know what Walt would have thought of Bolt as a film, but he would have surely been fascinated by its three-dimensionality, something he spent thousands of dollars striving for. In Pinocchio, he created ostentatious travelling shots using the multiplane, a giant camera holding multiple glass sheets on which cels, backgrounds and overlays were painted separately (much as Willis O’Brien had created King Kong’s Skull Island from multi-level dioramas a few years earlier). Pinocchio’s big multiplane shot shows an Alpine village awakening on the morning after the puppet’s “birth,” as we swoop and turn overhead like a bird. There’s another foreshadow of modern technology in the archive footage in the DVD extras. We see actors dressed as Pinocchio’s characters, performing on almost bare stages, perhaps following chalk outlines or using stand-in props (a sandbag substitutes for a cricket-scaled lump of coal). The footage was reference for Disney’s artists, but now it looks like the ancestor of such computer-age techniques as bluescreen and motion capture. The voice and reference model for Pinocchio was Richard “Dickie” Jones, who started in showbiz aged four. He was billed in rodeos as the “World’s Youngest Trick Rider and Trick Roper,” and he caught the eye of Western film star Hoot Gibson. Jones’ film career began in 1934. Days before he started work on Pinocchio, he was acting in a “Hopalong Cassidy” Western called The Frontiersmen, which also featured Evelyn Venable, the voice of Pinocchio’s Blue Fairy. Over the eighteen months that Jones worked on Pinocchio, he found time to act in six more live-action films. Jones compares the voice-acting in Pinocchio to a radio show. “We were on the soundstage, looking at the control room where the director and Walt were.” (Pinocchio had two supervising directors, Ben Sharpsteen, who made Dumbo (1941), and Ham Luske.) “I don’t think we did more than two or three takes on any one scene,” says Jones. Today, voice-actors on cartoon films often record in isolation, but Jones was able to play off his fellow actors, especially Edwards. “They had to sit on him, because he would keep me laughing all the time… I couldn’t concentrate on my work,” Jones remembers. “He never went anywhere without his ukulele, so when he wasn’t doing anything, he’d start strumming on it and singing songs. The great Disney animators who worked on Pinocchio are gone now (the last was Ollie Johnston, who died in April 2008). One man who knew them was Bob Baker who, like Jones, first visited the studio as a child. Baker was acquainted with Walt and his daughters, and would later become a puppeteer, handling a puppetry scene in Disney’s 1975 live-action Escape to Witch Mountain, remade as this year’s Race to Witch Mountain. Whereas Disney’s first animated feature, Snow White and the Seven Dwarfs (1937) was a hit, the costlier Pinocchio haemorrhaged money, with the studio eventually writing off a million dollars of its budget. 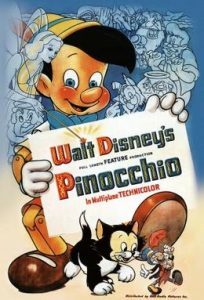 War in Europe blighted Pinocchio’s foreign sales, while some critics still argue that the film was too dark for American viewers. Pinocchio himself almost rushes from one nightmare to the next, the worst being Pleasure Island where delinquent boys are transformed into donkeys. For some viewers, the aesthetics of Pinocchio died with CGI. 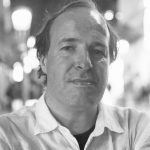 For all the 3D pretensions of computer animation, Jones finds the new medium flat. “It has no life to it. Snow White had a lot of life to it, and Pinocchio came out 100% better, and then it just got better and more lifelike. But then they found out they could push buttons…” Other critics, such as Barrier, maintain that Pinocchio was already betraying the spirit of cartoons, through its over-reliance on live-action. For most viewers, Pinocchio will be a bracing reminder of animation as it once was, from the vibrant brushstrokes and Germanic carvings of the toymaker’s home, to the flaming white foam that flies off the gargantuan whale Monstro in the tumultuous climax. For me, it was especially gratifying to see Pinocchio full size at Hollywood Boulevard’s El Capitan Theatre, another venerable institution restored by Disney. The El Capitan screening had extras not on Blu-Ray; palatial architecture, an organ rising through the floor and even Pinocchio in person, dancing live on stage.